The samples from which you selected your floor typically exhibit less than two square feet, while your floor will typically comprise hundreds if not thousands of times that area, and again no two pieces are exactly alike. A sample has also aged for an undetermined time period and in varying degrees of exposure, while your new floor has not yet had the opportunity to do so. Do not expect a sample to exhibit all possible color and light variation you will see in your floor. Natural stone samples may not show all possible variations in the sample. Only a manufacturer makes flooring, only an installation professional can turn it into a completed floor, and only you can maintain your flooring. You should be familiar with and observe all floor care and warranty information. Use appropriate cleaning supplies suggested by the manufacturer to keep warranties intact. Failing to follow manufactures maintenance recommendations may cause entirely preventable damage to the floor. See additional maintenance, care and warranty information below. Just as no two floors are alike, no two houses are alike, even though they might be next-door neighbors. Consider a few variables: Was the floor installed under exactly the same conditions by the same crew? Is the floor the same brand, grade, thickness, and identical in all respects? Did the same family live the same lifestyle in both homes? Were the floors maintained in the same way? When your floor is inspected, it stands on its own merits based on industry standards, not compared to another floor. While the durability of “glazing” or glass wear layers protects the surface from stains and moisture penetration, they are not scratch or damage proof. Manufacturer warranties cover “wearing through” the finish over a certain period of time under normal living conditions, but not scratches and dents caused by pets, unprotected furniture or other negligence. All tiles will show natural variances in shape, color, and caliper. The sizes of grout lines are used to alleviate the noticeability of variance. Allowable thickness variation of the tile modules when judged in accordance with manufacturing standards found at Tile Council of North America (TCNA) website. Occasionally, tiles will crack or break in transit. It is industry standard to use these tiles for fill or cut pieces. A small percentage of these tiles do not warrant replacing entire boxes. Correct installation methods and overage are used to account for this issue. Industry standards suggest adding 5-12% of flooring to the measured amount needed for the project. This added amount will account for cut pieces that cannot be used, breakage, and installation professional error. Larger tiles call for a larger percentage of necessary overage. 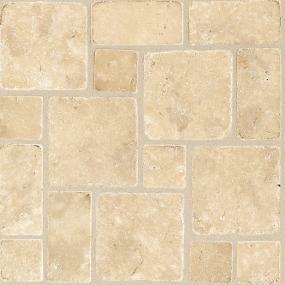 Bullnoses, mosaics and trims are meant to complement flooring styles & colors and are not exact matches.